Lexington, Kentucky native Betty Peters Preece graduated from Lafayette High School. She enrolled at the University of Kentucky and received a Bachelor of Science degree in Electrical Engineering in 1947, the first woman to receive an electrical engineering degree from UK. As a student, Mrs. Preece was a member of Alpha Lambda Delta, freshman honor society; secretary-treasurer of the AIEE, the predecessor of the IEEE; secretary-treasurer of the UK Amateur Radio Club; and editor of Kentucky Engineer magazine. Later in her career, Mrs. Preece earned a Master of Science degree in Science Education from the Florida Institute of Technology in 1974. After graduation, Mrs. Preece joined the General Electric Company, New York, New York, as a service shop engineer. In 1951, she became a project engineer in the Surveillance Systems Section, Air Force Missile Test Center, Patrick Air Force Base, Florida. From 1959 until 1967, she worked as editor of the Indian River Engineer, a publication of the Institute of Electrical and Electronics Engineers. Concurrently, in 1965, she joined the faculty of the Florida Institute of Technology as an adjunct professor in Graphic Science. From 1972 to 1990 she served on the faculty of Melbourne High School, Melbourne, Florida until retirement. She served as a volunteer engineer, design Section, 45th Civil Engineering Squadron, Patrick Air Force Base, Florida. Mrs. Preece’s most noted contributions came as a result of her tireless efforts aimed at advancing science education on the local, state and national levels. She championed the case for engineering as a career to women and under-represented groups. Mrs. Preece was recognized for designing and implementing innovative programs aimed at encouraging women, minorities and persons with disabilities to enter engineering and science careers. As a faculty member at Melbourne High School, she initiated the use of computer-aided instruction in the physics classroom and mentored at-risk secondary students for Brevard County Schools. 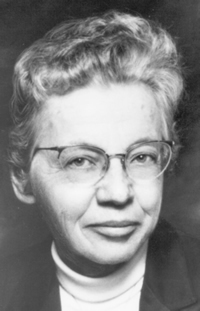 She was a true pioneer of the Society of Women Engineers, having served on the original organizing team and joining the Society in 1950, its first year of existence. She was involved in every level of SWE, from the local section and student activities to service on national committees and the board of directors. For the past ten years, she served as a member of the editorial board and been an active contributor to SWE Magazine. At the same time she served as the advisor of several SWE student sections simultaneously while still teaching high school. Mrs. Preece was a Fellow of the Society of Women Engineers, a Life Member of the Institute of Electrical and Electronics Engineers and member of the American Institute of Aeronautics and Astronautics, Women In Engineering Programs and Advocates Network, Women’s Engineering Society (Great Britain), Association of Women In Science and the American Association of Physics Teachers to name only a few. She was a member of Eta Kappa Nu, the electrical engineering honor society, and Delta Kappa Gamma and Phi Delta Kappa education honor societies. On three different occasions, she was chosen as a United States delegate to international physics education conferences with Japan and China. Mrs. Preece was honored many times for her work as an engineer and as an educator. She received the Distinguished Service Citation from the American Association of Physics Teachers, Sigma Xi Brevard County Science Teacher of the Year Award, United States Air Force Chief of Staff Volunteer Excellence Award for Lifetime Volunteer Service, the DAR National Thatcher Medal, and Indialantic (Florida) Citizen of Year. She was also the Florida Nominee for the Presidential Award for Science Teaching and named a Mortar Board Woodrow Wilson Foundation Fellow in Physics. Mrs. Preece authored over 100 technical and education-related publications and made presentations to countless professional societies in the United States and throughout the world. In 1991, Mrs. Preece and her husband, Raymond (BSEE ’48), established the Margaret and George Peters Scholarship in the College of Engineering supporting undergraduate students in electrical engineering. They also endowed a Women in Engineering Scholarship at the Florida Institute of Technology. Mrs. Preece died May 17, 2009. Her husband, Ray, had passed away in 2008. live in Indialantic, Florida. The Preeces are survived by two children.